Radial velocity measurements taken by Henri-Alexandre Deslandres at Paris Observatory showed that Mintaka had a variable radial velocity and therefore was a spectroscopic binary. His preliminary orbital period estimate of 1.92 days was shown to be incorrect in 1904 when Johannes Franz Hartmann using photographic plates taken at Potsdam Observatory showed that the orbital period was 5.7 days. Hartmann also noticed that the calcium K line at 393.4 nanometres in the stellar spectrum did not share in the periodic displacements of the lines due to orbital motion of the star and theorized that there was a cloud in the line of sight to Mintaka that contained calcium. This was the first detection of the interstellar medium. Mintaka is a multiple star system with a magnitude 7 star about 52 arcseconds away from the main component and an even fainter star in between. The main component itself is triple: a class O9.5 bright giant and a class B main sequence star orbit every 5.73 days and exhibit shallow eclipses when the star dims about 0.2 magnitudes; and a B-class sub-giant is resolved 0.26" away. At the primary eclipse, the apparent magnitude (of the whole system) drops from 2.23 to 2.35, while it only drops to 2.19 at the secondary eclipse. The seventh magnitude companion, HD 36485, is an unusual B-type main sequence star and itself a spectroscopic binary with a faint A-type companion in a 30-day orbit. 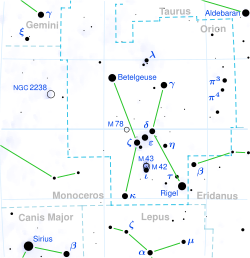 The 14th magnitude star is thought to be at the same distance, but it isn't clear whether it is physically bound to the primary star and little is known about it. The bright central star of the system is δ Ori A. Its components are generally referred to by researchers as Aa1, Aa2, and Ab, with HD 36485 referred to as Mintaka (or δ Ori) C, and the closer fourteenth magnitude companion as δ Ori B. Confusingly, some catalogues list δ Ori Ab as component B or component D, and Simbad names δ Ori Ab as Delta Orionis B. The three belt stars were collectively known by many names in many cultures. Arabic terms include Al Nijād 'the Belt', Al Nasak 'the Line', Al Alkāt 'the Golden Grains or Nuts' and, in modern Arabic, Al Mīzān al H•akk 'the Accurate Scale Beam'. In Chinese mythology they were also known as The Weighing Beam. The name Mintaka itself is derived from an Arabic term for "belt": منطقة or manṭaqa. The belt was also the Three Stars mansion (ရိုးရှင်းတရုတ်: 参宿; ရိုးရာတရုတ်: 參宿; ပင်ရင်: Shēn Xiù), one of the Twenty-eight mansions of the Chinese constellations. It is one of the western mansions of the White Tiger. In pre-Christian Scandinavia, the belt was known as Frigg's Distaff (Friggerock) or Freyja's distaff. Similarly Jacob's Staff and Peter's Staff were European biblical derived terms, as were the Three Magi, or the Three Kings. Väinämöinen's Scythe (Kalevala) and Kalevan Sword are terms from Finnish mythology. The Seri people of northwestern Mexico call the three belt stars Hapj (a name denoting a hunter), which consists of three stars: Hap (mule deer), Haamoja (pronghorn), and Mojet (bighorn sheep). Hap is in the middle and has been shot by the hunter; its blood has dripped onto Tiburón Island. In Spain and Portugal, this asterism is known as Las Tres Marías or As Três Marias, which stand for The Three Marys in Spanish and Portuguese respectively. In Christian astromythology, Mintaka is also regarded as the third of the three Magi on their way to Bethlehem (Sirius): Caspar, Melchior, Balthasar. ↑ ၃.၀ ၃.၁ ၃.၂ "MSC - a catalogue of physical multiple stars" (1997). Astronomy and Astrophysics Supplement Series 124: 75. doi:10.1051/aas:1997181. Bibcode: 1997A&AS..124...75T. ↑ ၄.၀ ၄.၁ "VizieR Online Data Catalog: UCAC4 Catalogue (Zacharias+, 2012)" (2012). VizieR On-line Data Catalog: I/322A. Bibcode: 2012yCat.1322....0Z. ↑ ၅.၀ ၅.၁ ၅.၂ ၅.၃ ၅.၄ ၅.၅ ၅.၆ "Tomographic Separation of Composite Spectra. VIII. The Physical Properties of the Massive Compact Binary in the Triple Star System HD 36486 (δ Orionis A)" (2002). Astrophysical Journal 565 (2): 1216. doi:10.1086/324705. Bibcode: 2002ApJ...565.1216H. 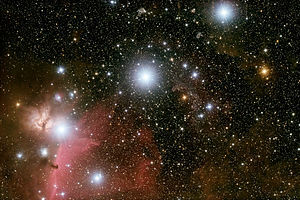 ↑ ၆.၀ ၆.၁ "The Tycho-2 catalogue of the 2.5 million brightest stars" (2000). Astronomy and Astrophysics 355: L27. Bibcode: 2000A&A...355L..27H. ↑ ၇.၀၀ ၇.၀၁ ၇.၀၂ ၇.၀၃ ၇.၀၄ ၇.၀၅ ၇.၀၆ ၇.၀၇ ၇.၀၈ ၇.၀၉ ၇.၁၀ ၇.၁၁ ၇.၁၂ ၇.၁၃ ၇.၁၄ ၇.၁၅ ၇.၁၆ ၇.၁၇ ၇.၁၈ ၇.၁၉ ၇.၂၀ ၇.၂၁ "A Coordinated X-Ray and Optical Campaign of the Nearest Massive Eclipsing Binary, δ Orionis Aa. IV. A Multiwavelength, Non-LTE Spectroscopic Analysis" (2015). Astrophysical Journal 809 (2): 135. doi:10.1088/0004-637X/809/2/135. Bibcode: 2015ApJ...809..135S. ↑ ၈.၀ ၈.၁ ၈.၂ "The magnetic field and circumstellar environment of the helium-strong star HD36485 = δ Ori C" (2010). Monthly Notices of the Royal Astronomical Society 401 (4): 2739. doi:10.1111/j.1365-2966.2009.15858.x. Bibcode: 2010MNRAS.401.2739L. ↑ ၉.၀ ၉.၁ "VizieR Online Data Catalog: General Catalogue of Variable Stars (Samus+ 2007–2013)" (2009). VizieR On-line Data Catalog: B/gcvs. Bibcode: 2009yCat....102025S. ↑ "SB9: The ninth catalogue of spectroscopic binary orbits" (2004). Astronomy and Astrophysics 424 (2): 727. doi:10.1051/0004-6361:20041213. Bibcode: 2004A&A...424..727P. ↑ ၁၁.၀ ၁၁.၁ ၁၁.၂ ၁၁.၃ "Properties of He-rich stars. I. Their evolutionary state and helium abundance" (1997). Astronomy and Astrophysics 324: 949. Bibcode: 1997A&A...324..949Z. ↑ "Variable velocity in line of sight of delta Orionis. (Notes)" (1900). The Observatory 23: 148. Bibcode: 1900Obs....23..148D. ↑ ၁၃.၀ ၁၃.၁ "Investigations on the spectrum and orbit of delta Orionis" (1904). Astrophysical Journal 19: 268–286. doi:10.1086/141112. Bibcode: 1904ApJ....19..268H. ↑ "A Catalog of Visual Double and Multiple Stars with Eclipsing Components" (2009). Astronomical Journal 138 (2): 664. doi:10.1088/0004-6256/138/2/664. Bibcode: 2009AJ....138..664Z. ↑ "Young stars and brown dwarfs surrounding Alnilam (ɛ Orionis) and Mintaka (δ Orionis)" (2008). Astronomy and Astrophysics 485 (3): 931. doi:10.1051/0004-6361:200809595. Bibcode: 2008A&A...485..931C. ↑ "A Coordinated X-Ray and Optical Campaign of the Nearest Massive Eclipsing Binary, δ Orionis Aa. I. Overview of the X-Ray Spectrum" (2015). Astrophysical Journal 809 (2): 132. doi:10.1088/0004-637X/809/2/132. Bibcode: 2015ApJ...809..132C.